WASHINGTON — A bipartisan group of senators Thursday unveiled legislation to improve background-checks for gun sales, a narrow measure that attempts to address the recent spate of mass shootings. The bill represents an incremental update to existing law but has the best chance of any effort to pass through Congress in recent years, with the weight of support from senior Senate Republicans behind it and no public opposition from the gun lobby. The bill, crafted by Sens. John Cornyn, R.-Texas, and Chris Murphy, D-Conn., would attempt to better enforce current law and strengthen the National Instant Criminal Background Check system to ensure all background check information is uploaded. According to a description of the bill, first obtained by NBC News, the “Fix NICS Act” offers a handful of solutions to help get all the necessary records uploaded, including asking federal agencies and states to produce plans to upload and verify the criminal and mental health records necessary to bar unfit purchasers from buying a weapon. Because the federal government can't force states to comply with uploading requirements, it creates incentives like grants for states to do so. It also adds accountability measures like withholding political appointees bonuses for agencies that fail to do so. The bill also directs federal funds to ensure that domestic violence crimes are added to the background-check system. This is the third attempt to fix the background-check reporting system since 1995. The NICS Improvement Amendments Act of 2007 provided millions to encourage the states to improve their data sharing. That was preceded by The National Criminal History Improvement Program, the first effort to give the states an incentive to report more records. “This deal will strengthen the background check system and save lives. Our bill marks an important milestone that shows real compromise can be made on the issue of guns," Murphy added. The National Rifle Association, a powerful gun lobby that gives heavily to elected officials, won't oppose it. “The National Rifle Association has long supported the inclusion of all appropriate records in the National Instant Criminal Background Check System," Jennifer Baker, NRA spokeswoman, told NBC News. And the National Shooting Sports Foundation has also endorsed, clearing the way for the Senate to move ahead. Sen. Richard Blumenthal, D-Conn., and Sen. Tim Scott, R-S.C., have also signed onto the bill, as have Sens. Orrin Hatch, R-Utah, Dean Heller, R-Nev., and Jeanne Shaheen, D-N.H.
Cornyn, Murphy, Blumenthal and Heller are represent states with the most deadly mass shootings: the Sutherland Springs church shooting, Sandy Hook, and the concert massacre in Las Vegas. Both Murphy, who has advocated for gun control legislation since the massacre at Sandy Hook Elementary School in 2013, and Blumenthal hinted at an agreement earlier Wednesday on Twitter. 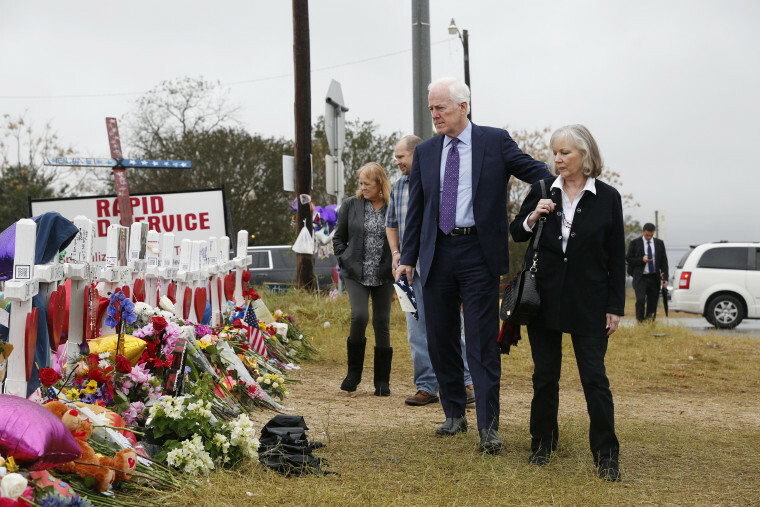 Meanwhile, Cornyn, the Senate majority whip, told reporters Sunday, "We need to fix this broken background check system." The last time gun control legislation came close to passing was after Sandy Hook when Sen. Joe Manchin, D-W.Va., and Sen. Pat Toomey, R-Pa., fell four vote shorts of passing their bill to strengthen background checks. Their bill was more expansive than the current one. It would have required background checks for gun purchases at gun shows and online. The proposed legislation comes as funerals are taking place for 26 churchgoers gunned down in tiny Sutherland Springs, Texas. The shooter's domestic violence conviction should have blocked his purchase of a rifle used in the massacre, but was not submitted to the background check system by the military. Pete Williams, Frank Thorp V and Jane C. Timm contributed.